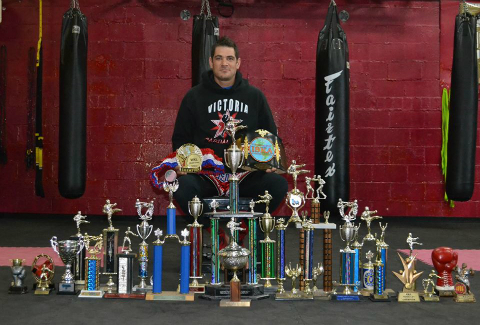 Robert Doerksen is the owner and head coach of Victoria Martial Arts (VMA). In 2010, he founded VMA with a mission to offer people a community where they were supported and encouraged to reach their martial arts and fitness goals. His passion towards pursuing excellence in training and coaching has no boundaries. As a fighter he has earned an abundance of awards both locally and internationally with a kickboxing record of 13 wins 3 losses. Rob won a WKL Canadian title in 2014 and the highlight of his fight career came in 2015 when he became the ISKA North American Kickboxing champion. He continues to compete with the top ranked pro-am kickboxers in North America. As a coach, he is committed to finding new methods to push the limits of everyone that walks through the doors at VMA. Accountability is very important to Rob in a coach-client relationship. He expects 100% effort from trainees and in return works to deliver the most effective training prescription. He is constantly enhancing and upgrading his knowledge of the sport through experience, certifications, and workshop seminars. During his career, he has had the good fortune to train with many excellent coaches and calls his coaching style a conglomeration of all of his previous coaches’ strengths. Rob has coached dozens of amateur boxers/kickboxers and carved out several champions along the way. Focusing on proper form, technique and the mechanics that lead to optimal success as a kickboxer. Rob prepares daily workouts and pushes the coaches to grow and learn internally in order to better lead the VMA community.